Agoda Everyday Deals: Up to 17% off on selected locations! Agoda lets you enjoy discounts of up to 67% off to book a trip of your desire stay on promo at in Canberra. Term and conditions apply. Make your bookings for a stay in Canberra now! Read more terms and conditions at Agoda's website! 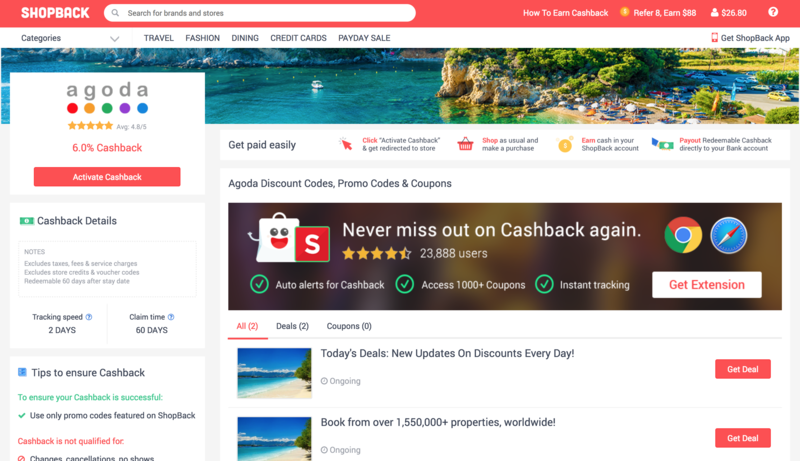 Agoda: Extra 10% off on selected destination and more with Cashback and a promo code! Book from over 1,550,000+ properties, worldwide! Book your short getaway now and enjoy a stay in Sarawak's capital, Kuching! Term and conditions apply. Extra up to 10% discounts on top of offers at Daegu with Agoda promo! Look for an Agoda discount code and save with Cashback! Scenic Daegu awaits your arrival! Book a stay at Surat Thani with Agoda with up to 5% off on promo! The splendour of nature is on offer for you at Surat Thani! Use Shopback to enjoy savings with Cashback! Accomodations at Hua Hin with up to 81% savings with Agoda promo! Accomodations in Georgetown up to 62% off with Agoda Promotion! Enjoy more when looking out for a Agoda promo code to save on top of Cashback using Shopback! Eclectic cultures and great food! Terms and condition apply! Up to 75% off Agoda promotion prices off Guangzhou hotels! Terms and conditions apply. Visit merchant website for more details. Find an Agoda promo code for more savings plus up to 80% discounts Incheon bookings. Subject to terms and condition. Visit Agoda for more details. Look for Agoda promo code at ShopBack to save more on top of 51% off Marseille hotels! Book now! Visit Agoda for full T&Cs. Rooms at Sapporo: Save up to 80% or check out ShopBack for the latest updates on an Agoda promotion! Agoda lets you enjoy discounts of up to 39% off to book a trip of your desire stay on promo at in Lombok. Up to 55% off on selected rooms in Batam Indonesia with Agoda. Find an Agoda promo code and cashback with Shopback! Book now. Terms and conditions apply! Term and conditions apply. Experience a stay in Liverpool! Read the terms & condition at the merchant's website! From 2 Aug 2017, 13:30 onwards, orders from Agoda via ShopBack will qualify for 6% Cashback. Your Cashback will be tracked as 0% before your stay is completed. Once your stay is completed, it will be adjusted to 6% Cashback before it turns redeemable. From 1 February 2017, 0:00 onwards, there will be no Cashback given for Agoda. Orders made before 1 Feb will still be able to receive tracked Cashback within 2 days. Plan a Weekend Getaway with Agoda Insider Deals! Have you tried booking hotels or flights online? If you have, you would know the pains of doing so, thanks to the plethora of choices around you. What you need then, is a brand that you can trust and a brand that has established itself as a pioneer in this space. Enter Agoda. Agoda can single-handedly take care of your prime travel booking needs. When we travel to a different town, state, or country, the primary needs are hotels and flights. Agoda ensures you have plenty of options to choose from either of the entities. Since the company operates at such a large scale, you will pretty much find a hotel that suits your requirements. Whether it is a luxury resort in an exotic beachside location or a sensible and economic hotel in the heart of a city, Agoda offers them all. Before we delve into different products, services and offers provided by the company, let’s take a moment to know a bit more about it. Agoda came into existence in the year 2005 and just like all big stories, started small. Over the years, due to its commitment to excellent customer service and some of the finest services, it has grown. Agoda now has footprints in over 30 countries and more than 45 locations. Though it began its operations in the Asia-Pacific region, Agoda is now an international brand in its true definition. In order to always provide state of the art features and functions to its customers, Agoda has deployed about 35% of its workforce into technologies. The company has more than a million listings in properties that you can use for accommodation, starting from homes to villas to hotels. For the traveler inside you, Agoda can help find new destinations and new experiences as well. After its immense success with accommodation booking, the travel pioneer company also ventured into flights booking. The Agoda today is in a well-evolved state than what it had started with a little over a decade ago., and an ideal platform for all your bookings. Now that we know Agoda is into travel and accommodation, let us take a closer look at all the services they have to offer. Hotels: Hotel bookings and Agoda are pretty much synonymous. Agoda offers you a host of options and parameters to zero down your search for an ideal place to stay. For instance, if you are looking for a hotel in Singapore, the website automatically selects the most popular hotels. Agoda also offers various filter options such as ratings by previous travelers, different payment options or even start ratings of the hotels. Homes: Agoda Homes is a service that connects you with homeowners who are willing to rent out their place. It lets you live in a home away from your home, bringing the comfort of a familiar environment on your new adventures. Over the past few years the demand for a 'home for rent' has gone up a few notches, and Agoda is at the forefront of giving you access to such services. Flights: Before you go ahead with your hotel bookings or home bookings, you would need to decide on your flights to the destination. Well, with Agoda you can now book your flight tickets as well. Whether you are flying within your country or outside it, you will find a deal that will bring a smile to your face. Airport Taxis: To make your travel even more seamless, Agoda offers you with airport taxi services as well. If you are travelling to a new place, a linguistic barrier can be one of the major hurdles, but not with Agoda. You can pre-book airport taxi service and use them as soon as you land. Say goodbye to mega queues and awkward hand gestures. How To Use Agoda for your bookings? Agoda uses a very simple, straightforward and intuitive user interface. Even if you are new to online bookings, you will find it relatively easy to proceed with any booking on the website or the mobile app. Travelers can either search for Agoda in their search engines or directly enter Agoda.com in their browser. You then need to select the kind of services you are looking for, the details of which you can find above. Depending on which service you opt for, the website would require minimal inputs, such as origin and destination city, dates for the services, and the count of travelers. The website will then search all the relevant options available for you and list it out. You need to select the one that suffices your requirements and proceed with the payment. Agoda would email you the booking details almost instantly, which you can use for availing the services. Travelers have the option of either taking printouts of the booking details or simply flashing their phone or tablet with the details on site. For all your accommodations related queries and tasks, Agoda not only ensures that you have an exhaustive list of options to choose from, but also the best deals you could possibly hope for. As a part of its commitment to provide you with only the best, the travel site offers some exciting deals. If you want a bit more out of your accommodation booking, the Agoda promo code will help you push the limits a bit further up. There are several coupon codes and discount codes up for grabs should you want to make your travel a tad more economical. What is even more interesting is that as part of Agoda promotion, there are several exclusive insider deals. This insider deals not only ensure you have the best rooms available for your price point but also have access to the finest services available. These secret deals will reveal the final name of the hotel or accommodation after a booking has been made. It is due to the backing of some excellent services and products that Agoda has reached great heights today. One such smart offering on the website is Today’s Deals. These deals are limited to a 24-hour window. If you keep checking the Today’s Deal page, you will surely land on an interesting deal. Once you select a deal, the website will flash a coupon code and you can use it during your booking. Details of how to use such codes are mentioned below. Agoda’s insider deals are an exclusive affair available only for its members. The deals are not available for general public. Once you become a member of Agoda Singapore, you can avail special prices for hotel bookings and even flights using insider deals. These are on the top of normal offers and discounts that the website offers for everyone. Under this segment, there are flash deals as well, which offers discounts up to 50% at times. Individuals who like to travel a lot will benefit majorly with such services. November is here and along with that comes the much awaited Singles Day season! If you're looking to make your bookings for a year end getaway, why not go to ShopBack where you can find information on the latest Agoda Black Friday or Cyber Monday deals. You might have the chance to get great discounts or even an Agoda Black Friday or Cyber Monday promo code! ShopBack gives you another reason for you to travel with the latest scoop on Agoda 1212 sale and deals! 1212 is here and to get the latest on all that is Agoda 1212 sale and deals, be sure to swing by ShopBack! Save on your travel bookings so you can spend on things that matter more ! Save on your travels with ShopBack! PointsMax is a reward system in place for customers of Agoda. The reward program allows you collect points with each booking and earn several other benefits along the way. Agoda has tie-ups with several major partners in the airline and hotel industry space. When you are part of the PointsMax program, you get to multiply the respective loyalty programs by several times over. The website lists all the loyalty programs that it has tie-ups with. You can select any of the familiar labels and see the benefits of joining PointsMax. For an example, if you are a part of Big Loyalty Program of AirAsia, for every $1 that you spend on the packages provided by PointsMax you can multiply your Big points by as much as 8 times. To access PointsMax, one would need to login to their Agoda account. Upon login, you need to select your name in the top right corner and the PointsMax option will be available. Book Now Pay Later (online payment): Make an instant booking but payment only 2 -3 days prior to hotel booking conditions becoming active. Only then will the full amount be charged. Do note that this is only available for Visa, MasterCard, AMEX, and JCB credit cards. Select 'Pay Later' option when inputting your credit card details. Special Rates (on site payment): If staying at a hotel where an agoda.com partner has provided the lowest rate, the card will not be charge despite a confirmed reservation. Users will pay the hotel directly upon checkout, and the hotel's own cancellation policy will apply. This option is indicated in the 'special rates' section. As a part of serving customers better, Agoda has several promotions all through the year. Individuals who are frequent travellers, checking the Agoda website or mobile app on a regular basis can be a great idea to save money. During these promotions, Agoda offers a discount on a lot of its services. Since you are looking into these services in the first play, why not do them when there are some offers and discounts? Agoda promo code can be in different modes. While some can result in straight off monetary benefits, others can result in rewards. Also, there are offers pertaining to specific Credit cards from time to time. Coupon codes could be found on ShopBack's merchant page, or in the many promotion pages on Agoda's official webpage. There would be a 'get coupon' notification for you to click on, and the Agoda discount codes will appear. Remember to copy and save them for your checkout later on! How to Apply Agoda Promo Codes? Booking your tickets or hotels online via Agoda brings in a world of convenience right from the comfort of your home. You can not only browse through different services instantly, but also decide one based on various parameters such as user ratings or price. 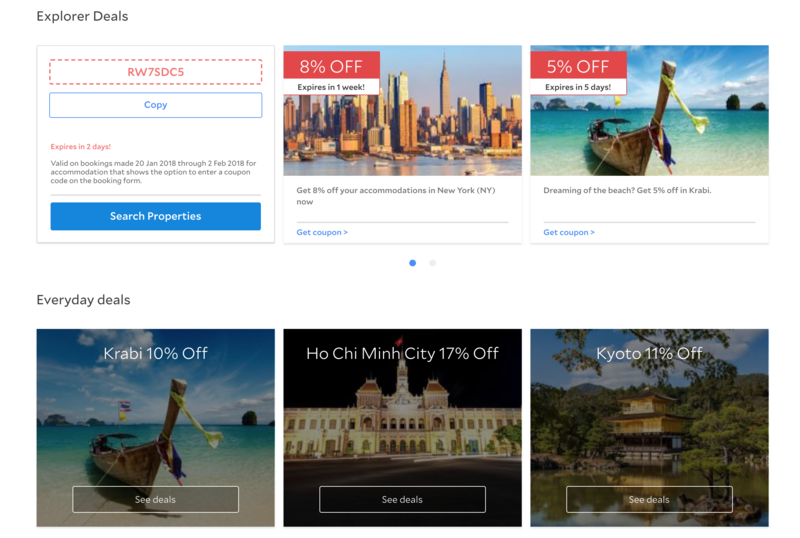 When you apply coupon codes, you get a shot at creating an economic trip. 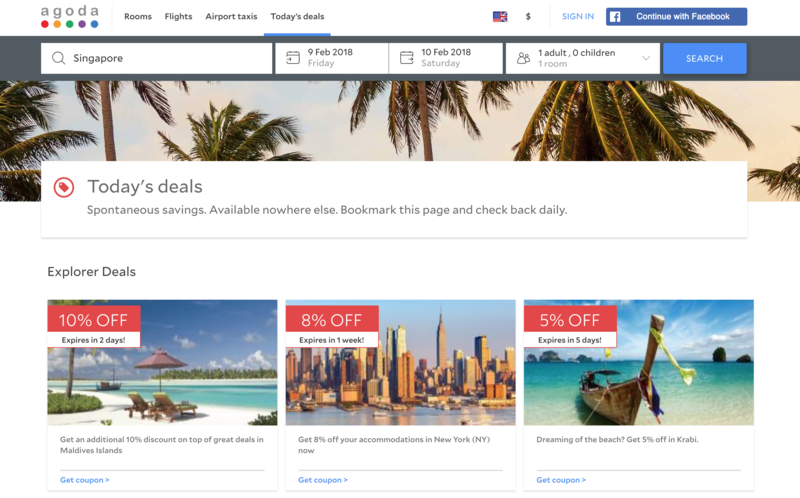 Here is how you can use coupons and promo codes while booking. Select the service you wish to use. Fill in the required details, such as origin, destination and travel dates. Select the flight or room from the listing that fits your needs. Go ahead with the ‘book’ option. Agoda lets you review all the details and asks for your contact information. When filling in the payment details, you can enter your promo codes. The website will immediately show the benefits of the code that you have applied. You can then proceed with your booking. A short visit to ShopBack can enhance your booking experience by a few notches. First of all, ShopBack lists out all the regular deals and latest offers available. Secondly, there are also additional exclusive coupons and vouchers which will bring down the booking costs. To add on, booking through ShopBack entitles the user to earn cashback on top of the voucher benefits, so you can save even more booking the same room or flight. This not only include your transaction from Agoda but also from merchants such as Booking.com and Expedia! To do so, first create an account on ShopBack. Then look out for the merchant name by entering it in the search bar or searching for Agoda in the 'Travel' category. From there, pick from the deals you wish to have, and copy any promo codes available that would suit your needs. Click on 'get deal' and get transferred to the merchant homepage. From there, just make your bookings as per usual. Just make sure you make your transaction all in the same tab! Once the transaction is complete, hold on tight for the cashback email to confirm your cashback; after the trip, the amount will be credited to your ShopBack account! When you use Agoda for your bookings, the travel aggregator will send an email confirmation to your registered email ID instantly. If you do not receive the same within a few hours, do not shy away from contacting the customer service desk. Regardless of how much we advance with technologies, we cannot predict the future, at least not yet. There might be instances where one has to cancel the bookings. You can cancel your bookings without any hassles on Agoda. Unless it is specifically mentioned, Agoda will not charge any fees for the cancellation. All the bookings have a predefined allowed date of cancellation. Any cancellations made post these dates might result in a deduction of payment. For hotel bookings, it would mean cancellation charges for one night’s booking. If you wish to modify your existing booking, you can do the same via Agoda. Instead of modifying the details directly with the hotels, you can reach out to Agoda customer service desk for help with any updates you require. Should there be a worst-case scenario where you have to cancel your trip and the hotel bookings, Agoda has you covered in that aspect as well. You can cancel hotel bookings before 14 days of the actual dates without any charges unless specified. No matter, the situation, you need to place a request for refund of the payment post the cancellation of bookings. Refund requests are handled within 10 working days of receiving the request. If there are any penalties, those will be deducted and the pending amount will be credited to your account. Having an excellent customer service desk helps Agoda with its ambitious plans for growth. Given its experience with prior customers, the company has an exhaustive FAQ section. Should you have any doubts or queries, this section would most probably have a solution. In the event it does not, you can access the customer service portal. You would need to select a generic group of issues and provide some personal information and then can submit the request. Alternatively, you can call Agoda at +65 6329 7537 or you can use the international contact number +44 20 3027 7900.